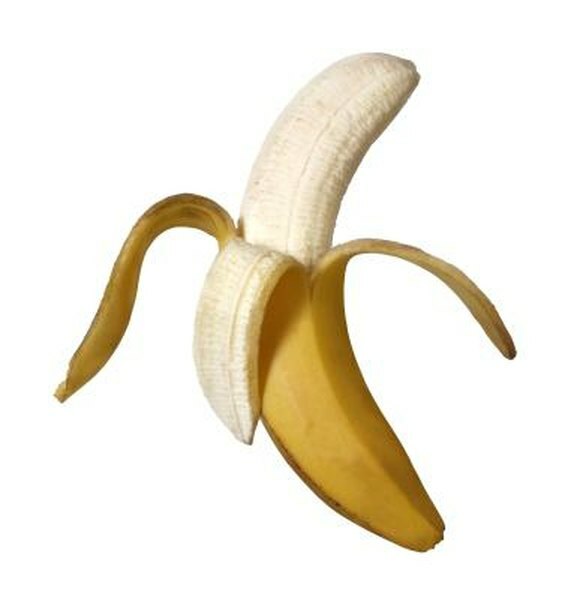 The banana has some of the highest potassium values of all fruits, surpassed only by its cousin, the plantain, and larger whole fruits, such as the papaya. The potassium you get from foods is crucial to your muscle function and blood pressure. At 422 milligrams per fruit, bananas provide less than 10 percent of the 4,700 milligrams of potassium recommended daily for adults by the Institute of Medicine. You can achieve your nutritional goals by adding bananas and a variety of potassium-rich foods to your menus. According to the U.S. Department of Agriculture, cooked white beans make some of the largest possible contributions of potassium to your diet, with 1,189 milligrams in 1 cooked cup. Beans are high in fiber and low in fat, so you can eat them often without threatening your weight. Related to white beans, lentils, split peas and pinto beans all have high potassium levels, too. Beans and other legumes contain additional nutrition that benefits your cardiovascular and musculoskeletal systems, including calcium, iron, protein and B vitamins. Gain another big step toward your daily potassium goals by eating baked potatoes often. Like beans, they have lots of fiber, little fat, and some iron, protein and B vitamins. Scooping out the interior potato flesh will provide 610 milligrams of potassium, but eating the skin, too, will nearly double the nutrient value. A whole potato baked in its skin has 1,081 milligrams of potassium, while a sweet potato prepared in the same manner offers 694 milligrams. Boiled potatoes have significantly less potassium. Unlike potatoes, spinach and related leafy vegetables increase in potassium value when boiled. Compare the 167 milligrams of potassium in 1 cup of fresh, raw spinach to the 839 milligrams of mineral content in 1 cooked cup of spinach. Less widely available but more potassium rich are beet greens, which yield 1,309 milligrams per cooked 1-cup serving. Spinach has the same added nutritional benefits as potatoes and beans. While a single tomato has about half the potassium content of a whole banana, tomato juice, tomato sauce and vegetable marinara sauce made with tomatoes soar past bananas. One cup each provides potassium totals of 556 milligrams in tomato juice, 790 milligrams in prepared marinara sauce and 811 milligrams in tomato sauce. Low fat and moderate fiber, iron and B vitamins accompany the potassium in tomatoes. One cup of chopped tomato has 427 milligrams of potassium, or roughly the same mineral content as one banana. Yogurt is a high-potassium food that supports your heart and muscles with important calcium and B vitamins as well. Yogurt without fat has better mineral value than low-fat or whole-milk varieties. Eight ounces of plain nonfat yogurt offers 579 milligrams of potassium.